India has a long tradition of creating delicious vegetarian food because many people do not eat meat - either for religious or economic reasons. This recipe is a North Indian style curry, and it is absolutely delicious. Thoroughly rinse the beans and soak them overnight in cold water. If you don't have time to do that, you can try a quicker method - start them off soaking in boiling water, add a teaspoon of bicarbonate of soda and soak for two hours minimum. You can buy ginger and garlic paste in Asian shops, but if you're making your own you'll need to peel and mince the garlic and ginger together with a little vegetable oil. Rinse the soaked beans and place them in a large saucepan with enough water to cover them by a couple of centimetres (an inch). Bring to the boil and skim off any scum that forms. Cover and simmer until the beans are tender - this could take anything between 30 minutes and 2 hours, depending on how old they were to start with and how long they were soaked for. If you are using any whole spices (as I am with the cumin and coriander seeds), you need to toast them in a dry frying pan for a few minutes until they are lightly browned and start to release their aroma. As a rough guide, if a recipe calls for 1 teaspoon of a ground spice, use 1 tablespoon of the whole spice. Set the spices aside to cool, and then grind them to a powder in a spice mill or mortar and pestle. Done all that? Now we can start making the curry. Peel and finely chop the onion, and fry it in the oil for about 10 minutes until browned. Add the salt about half way through. While this is going on, make a puree of the tomatoes using a stick blender or food processor. When the omions are browned, and the ginger and garlic paste and cook for 2 minutes more. Add the spices and cook for a further 2 minutes, and finally stir in the pureed tomatoes. Cook this for at least another 2 minutes, until you see oil begin to separate out from the sauce. Remove from heat until ready to use. When the beans are cooked, put the sauce back on the heat, drain the beans (but keep the water) and stir them into the sauce. Add some of the cooking water from the beans if it seems too dry. Finally, throw in the spinach leaves. They only need a minute or two to cook, so add them just before you are ready to serve. Serve the curry with naan bread or rice (or both! ), and any other Indian accompaniments you fancy. The video above is from the Keef Cooks YouTube channel. 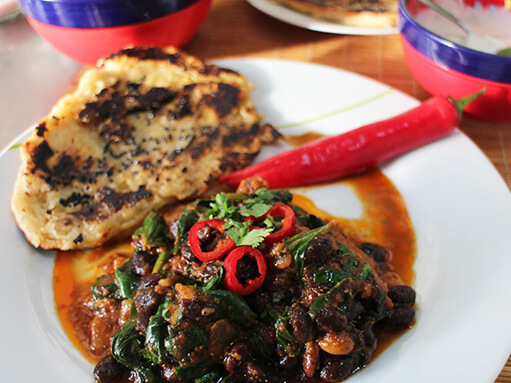 Click here to see the video recipe of Black Bean and Spinach Curry on YouTube. Sliced fresh chilli and coriander leaves to garnish. The beans can be pretty much whatever you like - I used black soya beans for this. Prep time: 30 minutes. soaking time time: 2 hours. Total time: 3 hours 15 mins.